What to look for when shopping for store-bought broth and stock. 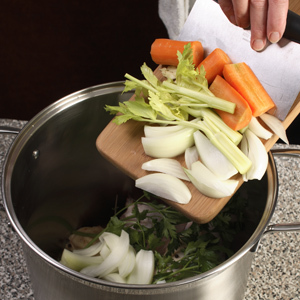 Stock or broth is the flavored liquid that comes from simmering vegetables, herbs, meat and/or bones in water (sans meat or bones for vegetable broth). Some definitions specify that stock is made with the bones and broth without them, though we use (and store-bought products use) the terms interchangeably. Some store-bought broth delivers close to 1,000 mg sodium/cup, which may be the majority of your daily recommended sodium intake! Look for reduced-sodium (averaging 500 mg/cup), no-salt-added (averaging 200 mg/cup) or low-sodium (140 mg or less/cup) stock or broth. Some are lower in sodium, but not labeled as such—check the nutrition panel to compare among brands. When you add it to a recipe, the flavor of the stock will affect the final dish. Taste it first, if it doesn’t taste good to you, try another brand until you find one that pleases your taste buds. EatingWell recipes are developed using reduced-sodium broth. Stock and broth can be used interchangeably in all of our recipes. If you have high blood pressure or are on a sodium-restricted diet, you may want to use “no-salt-added” or “low-sodium” versions instead.